In a rare affirmation of Israeli policy, the United Nations defended Israel's maritime blockade of the Gaza Strip as a legitimate and legal security measure in its official report on the May 2010 Gaza flotilla clash. "Israel faces a real threat to its security from militant groups in Gaza," the report says in its opening paragraphs. "The naval blockade was imposed as a legitimate security measure in order to prevent weapons from entering Gaza by sea and its implementation complied with the requirements of international law." The 105-page Palmer Report is due to be released today, but the New York Times was able to obtain a copy in advance. It finds that when Israeli commandos boarded the lead ship attempting to break the blockade, they encountered "organized and violent resistance from a group of passengers" necessitating the use of force in self-defense. Turkish officials reacted angrily, saying they do not accept the findings and would initiate a series of diplomatic moves, further eroding relations with Israel. But the UN report faults the commandos for responding with "excessive and unreasonable" force, and claims no final warning was given to passengers on the lead ship before boarding. "Forensic evidence showing that most of the deceased were shot multiple times, including in the back, or at close range has not been adequately accounted for in the material presented by Israel," it says. The Palmer report was the result of a UN inquiry into the events on the Turkish-flagged lead ship of the flotilla, the Mavi Marmara. Flotilla organizers "acted recklessly in attempting to breach the naval blockade," it says. It also reaffirms what Israel has long said, that the majority of the hundreds of people on board the six vessels in the flotilla had no violent intentions, but that the Turkish "aid" group that organized the expedition, the IHH, had more sinister plans. "There exist serious questions about the conduct, true nature and objectives of the flotilla organizers, particularly IHH," the report states. Turkey, it says, could have done more to disrupt the flotilla's plans. Both Israel and Turkey have challenged the report's findings and delayed its publication three times while seeking to repair their long-standing alliance and prevent the report from being made public. Now, both sides fear that, instead of reconciliation, the report will lead to a further deterioration in their relations. Turkey is particularly troubled by the conclusion that Israel's naval blockade is legal and that Israeli forces have the right to intercept ships headed to Gaza in international waters. These findings, according to Turkey, go beyond the stated mission of the four-member panel appointed by the UN secretary general to investigate the incident and contradict previous UN resolutions. Turkish Foreign Minister Ahmet Davutoğlu expelled Israeli diplomats from Turkey on Friday, announcing that Israel's diplomatic presence there was being downgraded. "Turkey-Israel diplomatic relations have been reduced to a second secretary level. All personnel above the second secretary level will return to their countries by Wednesday at the latest," Davutoğlu said in a news conference. In addition, Davutoğlu also announced that Turkey was suspending its military agreements with Israel. These actions follow threats made by Davutoğlu on Thursday that Turkey would issue sanctions against Israel if Israel failed to offer a public apology for the incident prior to the report's release. The Turks have also warned that they would sever economic ties with the Jewish state as part of its "plan B" if Israel did not comply with its request. Turkish President Abdullah Gul backed Davutoğlu on Friday, saying his remarks reflect the official position of the Turkish state on the report. In Turkey's eyes, the UN inquiry panel's report is "non-existent" and the only reason his country waited to take reactive measures was to give allied countries an opportunity to negotiate a reconciliation agreement. "The measures announced today constitute the first step," Gul said. "In line with the progress of events and Israel's stance, additional measures can be taken in the future." In order to achieve the peace and stability that Turkey seeks in the region, Gul said Israel would have to take some steps of its own. For its part, Israel considers the UN report to be a rare display of support from an institution that typically reprimands the Jewish state—and actually did so in the immediate aftermath of the flotilla incident. Israel had hoped that by agreeing to negotiate with Turkey to stop the report's publication, Ankara might reconsider its stance towards the incident, but the negotiations reached an impasse over Israel's refusal to issue an apology. The Palmer report recommends that Israel "make an appropriate statement of regret" and pay compensation for the victims, which Israel has agreed to do. However, Turkish Prime Minister Recep Tayyip Erdogan has said that these acts are not sufficient to return his ambassador to Tel Aviv. Erdogan has also insisted that Israel end the naval blockade on Gaza. Aides to Israeli Prime Minister Benjamin Netanyahu have said that the he might reconsider Turkish requests if the former ally softens its position. For now, however, Netanyahu believes an apology would display weakness and would be an affront to Israelis. In addition to finding the blockade to be legal and justified, the Palmer committee expressed strong concern for the thousands of rockets and mortars that have been fired into Israel from Gaza in recent years. The UN inquiry panel was headed by Sir Geoffrey Palmer, former Prime Minister of New Zealand, who was aided by Álvaro Uribe, former president of Colombia, along with a representative each from Israel and Turkey. 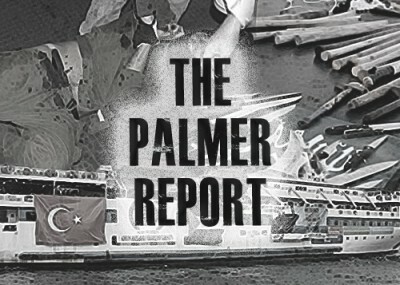 Though both Israel and Turkey have released their own reports on the incident, each blaming the other and offering narratives to support their accusations, the Palmer Report hoped to clarify all conflicting claims and put the issue to rest. Turkey's drastic reactions to the report, however, suggest that this will not be the case.